This year marks the 150th anniversary of public education in Tasmania. To help us understand where we’ve come from (and perhaps where we’re going!) the librarians and archivists of the State Library and Archive Service are producing a series of blogs on the history of public education in Tasmania. These aren’t comprehensive – rather, they’re snapshots of places, people, and institutions, as well as a guide to the resources we hold at the State Library. Some of the common themes that feature throughout the blogs are concerns about the curriculum; about health, physical fitness, and nutrition; about sanitation; about industrial training and academic outcomes. But these blogs are also something more – they’re about the history of childhood in Tasmania, and how our view of children – and what education means – has changed since the nineteenth century. We hope you enjoy the journey! The Orphan Schools established in Hobart in 1828 were an early form of public education, but a harsh one. Their aim was to transform poor children into ‘respectable’ industrious adults. The system was cruel even by the standards of the day – based on discipline, religion, punishment and control. Most of the children were not true orphans, but the children of convict parents, whose imprisonment and work for the convict system prevented the parents from caring for them. Others were the children of the unemployed, destitute, or those that the authorities perceived to be leading immoral lives. Some Aboriginal children were institutionalised as well. All were separated from their parents, housed in cold rooms with no fires and poor sanitation; disease was rampant and mortality was high. What follows is not easy reading, and it is not suitable material for young children. The story is characterized by cruelty, abuse, and neglect, but also by tremendous resilience, resistance, and compassion. The historical records in the Tasmanian Archives tell this story – and throughout this blog, we will link to them. You, the reader and researcher, can choose to follow the story further in as much in depth as you choose to. The orphan schools were not the only form of education in the colony prior to 1868, but they are one of the best-known. The buildings themselves still exist in New Town, and their history is entangled with the family histories of many Tasmanians. That’s because the orphan schools linked the convict system with public education and social welfare. The colonial government (and many free settlers) feared that the penal colony of Van Diemen’s Land would always be a haven of vice – and thought the best way to prevent children inheriting the ‘stain’ of their parents was to remove them, discipline them, and reform them. In 1826, Archdeacon Scott laid out a plan to Governor Arthur for a system of public education. He would remove children from their ‘dissolute’ parents (especially if they were convicts, unmarried, and/or poor) and train them in infant, primary and orphan schools around the colony. From the co-operation of church and state, Scott argued, there would be moral reclamation, and “a new race must spring up”. 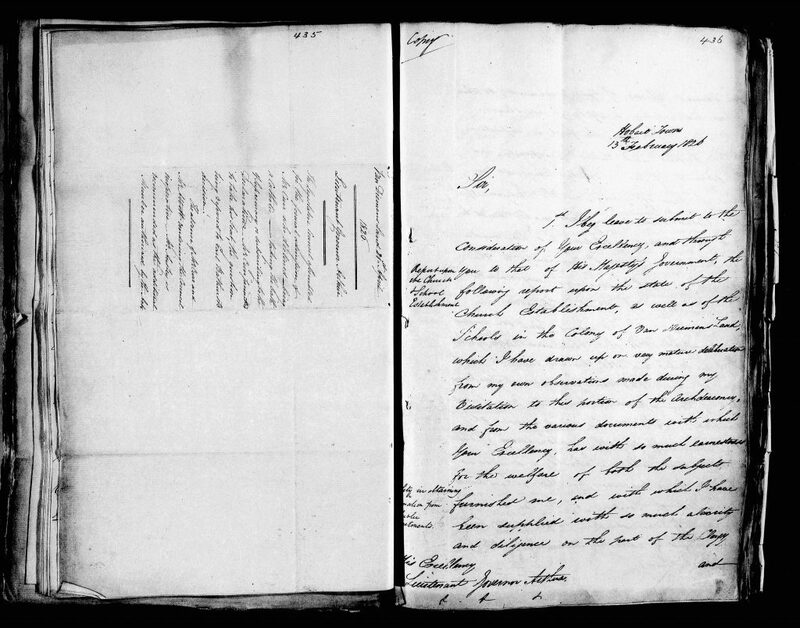 At the same time, Governor Arthur ordered a survey of destitute and orphaned children in the colony (CSO1/1/122a, often known as the “Children’s Census”). Various ministers of religion and local magistrates reported to Arthur the children in their districts. In all, over 100 children were said to fit the criteria as being eligible for care in an orphan school. This number was to grow rapidly as the 19th century progressed. You can read more about this in our forthcoming blog, “Looking for the Lost Children” by librarian Elizabeth Lehete. SWD26/1/1: An application for admission to the Orphan School. Tasmanian Archives. It’s important to remember that “orphan” in the early nineteenth century didn’t mean a child with no parents living. It was actually a very loose term, one that meant any child who was thought to be uncared for or destitute. Admission was made by applying to the Governor. This was undertaken by the parent, guardian, or on advice from those in charge of the asylum. Most of the children had parents who were convicts, and had arrived on the convict ships with their mother. There is now a sculpture on the Hobart waterfront, “Footsteps Towards Freedom” by Irish sculptor Rowan Gillespie to honour them. In general, children under the age of three were taken to the Cascades Female Factory with their mothers (being left in the care of other convict women if their mother was sent into assignment after the baby was weaned). Not all of the ‘orphans’ came from convict families, however. For example, there were children of an agricultural worker of Old Beach whose house was burnt down and family left destitute; or the free settlers whose ship was wrecked on the way to Hobart. Some free parents paid money to the orphan school for the education of their children. Some children had unknown backgrounds, and were “orphans” as we would use the term today. Edwin Burns was “found wandering about in state of total destitution and had been in the bush for several years among the worst characters his father is dead and mother if any exists has totally deserted him.” There were also a number of Aboriginal children – survivors of the “Black War”, offspring of sealers and Aboriginal women, or those who had been living with white families. Research suggests approximately 20 Aboriginal children had been in the schools, including those sent away from Flinders Island. Once inside the Orphan School, it was difficult to leave – especially when parents were desperate to bring their children home. This was because on entering the institution, the governor became the children’s legal guardian, and a committee would scrutinize the parents’ circumstances to determine whether or not they could care for their children. Many parents’ applications to bring their children home were refused. This was the case of William and Jane Davis. Both were convicts, and when they received tickets of leave, they wrote stating they could now care for their child. The authorities refused to release the child, but told the parents that they would now be expected to pay for their maintenance. Some parents defied the authorities. There is the case of a Mr Butcher of Bagdad who took his child out of the school on the pretence of buying him some shoes, never to return. Children regularly ran away, though they were usually captured, returned, and often beaten. Originally, there were two orphan schools – one for boys at the Constantina Distillery on the New Town Rivulet (established in 1827), and one for girls at Belle Vue in Davey Street. From the very beginning it was clear that the buildings were unsuitable. They were badly overcrowded – at the Boy’s Orphan School, two or three children shared a bed, and the school room itself was hung with hammocks, which were removed before the start of lessons. A report in December of 1828 recommended a new building with two school houses, “each … with its outhouses, yard, garden and ground… effectively detached from the other, and its appendages as to prevent so far as practicable, the children of one [gender] from mixing with those of the other.” To keep the numbers down, children were sent out to work as servants to reduce the numbers. The new school took five years to complete. This structure, designed by architect John Lee Archer still stands today at the top of St John’s Avenue, and it was opened in 1834. A church was incorporated in the design for both inmates of the schools and the parishioners of New Town, and it became central to the whole community: free, convict, and orphan. But the different classes were kept separate – galleries and screens worked to keep the orphans separate from the choir, the prisoners and the public. Occasionally when the parishioners closed their eyes in prayer they would have still been aware of their fellow congregation members by the outbreak of insect infestations on the church pews. In 1848, a report by the Inspector of Schools, Charles Bradbury documented how little had changed. At this time the Superintendent was Charles O’Hara Booth who had formerly been in charge of the establishment for boy convicts at Point Puer. The boys were issued with three suits, two made from moleskin and the third, a Sunday suit of blue cloth. These suits were made by female convicts on the convict hulk HMS Anson, as the material was “too stubborn for the strength of the boys’ fingers”. Their shirts were made by the girls of the institution. The girls made their own dresses and wore bonnets made on the Anson. Unlike the boys, the girls wore socks inside their ill-fitting shoes. Clothes were recycled to the younger inmates as the older ones grew out of them. Hampton was alarmed by the children’s physical development, stating that they were inferior “to other children of the same class.” He put this down to the lack of exercise. He suggested starting a garden, cultivated by the children, with the produce to be sold to the town’s greengrocers and the proceeds going towards the children’s maintenance. He also suggested that the best students be enrolled in the neighbouring Normal School to undertake training for teaching at the Orphan School. Some of these changes were introduced over the following years, but the Normal School was abandoned within 2 years, closing in 1851. It was an open secret that the Orphan Schools were rife with abuse. There were numerous commissions and inquiries into conditions, many of which documented severe beatings, neglect, and systemic abuse. These records make for very difficult reading, but it’s from them that we get a few of the voices of the children themselves – though they testify to a bleak existence in which some were willing to endure violence in exchange for food and shelter. These records can be found in the correspondence of the Colonial Secretary’s Office, the Meetings of the Committee of Management, the Tasmanian Parliamentary Papers, and other sources – there is a partial list under “Further Reading” at the end of this blog. Dr. Edward Swarbreck Hall was also crucial in documenting the abuses at the Orphan School. He was a medical and sanitary reformer who acted as a watch dog for nearly two decades between the 1850s and 1879 when the school closed, interviewing children, inspecting conditions and taking administrators to task. The curriculum at the Orphan School consisted mainly of rote learning and the 3Rs – reading, writing, and arithmetic. Two afternoons a week were set aside for religious instruction. The inmates also attended church daily. In 1848, Inspector Bradbury was not impressed with what the children had learned. One wonders whether this had more to do with his questions than with the children’s learning – according to Bradbury, none of them could explain the meaning of self-denial nor where Jamaica was located. He gave the children two days to compose an essay on the subject “the advantages of being industrious” but no one wrote a line. The resilience of the students – and their determination to learn – under these conditions was astonishing, and many did go on to become heads of households, respectable citizens, and leaders in their communities – and you can read about their stories in Dianne Snowden’s . Voices from the Orphan Schools : the children’s stories. Some of the Aboriginal children who left the Orphan Schools went on to become powerful advocates for their community – men and women like Walter George Arthur (who organized the first petition of indigenous people in the British Empire to Queen Victoria in 1846, documenting the abuses of Dr Jeanneret at Flinders Island) and Fanny Cochrane Smith (who received a land grant, raised a large family, and fought until her death to preserve Aboriginal culture in Tasmania – recordings of her voice are the only records we have of Tasmanian Aboriginal songs). The Fox’s Feast was an event that brightened the often bleak year of the children of the Orphan School. 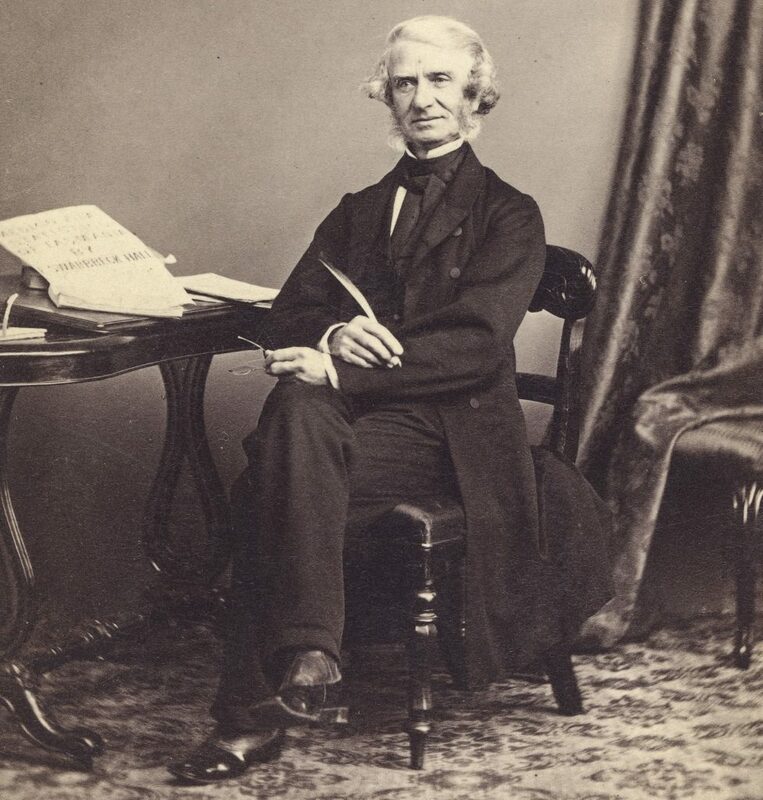 John Fox was a waterman who had plied his trade on the Derwent for decades, and he left a bequest to the Orphan School children when he died in 1859. Fox had not been a former inmate of the institution, but was an orphan when he was transported as a boy. “His bequest should be appropriated to the benefit of the children in the institution and not to that of the government or the government or the maintenance of the establishment ….he wished all the children to have a feast after they attended his funeral.” Thus the appropriately named Fox’s Feast was born. There is at least one contemporary account of Fox’s Feast from 1872. On the 13th of February, in what is now known as the Cascade Gardens, 350 children were given meat, pastry, ginger beer and fruit. The children (who had to march from New Town to Cascades and back again to get their treat) were able to revel in the sunshine and the beauty of the gardens for a few hours, fill their bellies, play games, and listen to music. The bequest of John Fox is still legislated in some form to this very day. By the late 1860s, the number of children entering the Queens Orphan Asylum began to decline, owing to a new system of outdoor relief, the introduction of the boarding-out system, and the establishment of industrial schools and the Public Education Act. This decline in numbers saw the closure of a building constructed in 1862 specifically for infant children. In 1874 it was utilised as a charitable institution for women. By March of 1879 arrangements were underway to close the orphan school with the remaining children sent to other institutions such as the Boys Home in Lansdowne Crescent and the Catholic orphanage, St Joseph’s, in Harrington Street. You can read more about the circumstances of the closure of the Orphan Schools in CSD10/1/70/1717. Joan Brown. Poverty is not a crime : the development of social services in Tasmania, 1803-1900. Hobart : Tasmanian Historical Research Association, 1972. Kim Pearce and Susan Doyle. New Town : a social history. [Hobart, Tas.] : Hobart City Council, 2002. Derek Phillips and Michael Sprod. Making more adequate provision : State education in Tasmania, 1839-1985. Hobart, Tas. : Government Printer for the Education Department of Tasmania, 1985. Joyce Purtscher, Apprentices and absconders from Queen’s Orphanage, Hobart Town, 1860-1883. Hobart, Tas : I. Schaffer, 1994. Joyce Purtscher. 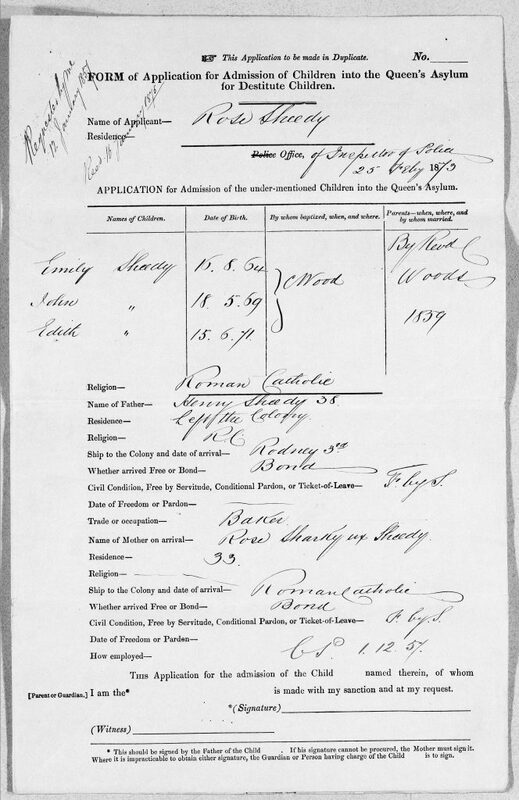 Applications for Queen’s Orphanage : Hobart Town 1858-1878. New Town, Tas. : Irene Schaffer, 1993. Joyce Purtscher. Infants at Queen’s Orphanage, Hobart, 1851-1863. [Hobart, Tas.] : Van Diemen’s Land & Norfolk Island Interest Group, 1993. Michael Sprod, ‘The Old Education’ Government Schools in Tasmania 1839-1904. Paper presented to the Tasmanian Historical Research Association, 8 May 1984. Robert van Krieken. Children and the state : social control and the formation of Australian child welfare. North Sydney : Allen & Unwin, 1992. 1831 enquiry into Robert Giblin, first head master at the Boy’s Orphan School, who beat a 14 year old boy to death: The gruesome facts of the case, and the testimony of the boys can be found in CSO1/1/122/3073, CSO1/1490/10836 and SWD24 , all of which you can read on microfilm in the Reading Room in the Hobart Library. Thanks for sharing the history of the former Orphan Schools in New Town. Here is some information about the current use and recent ‘history’ .